Discussion in 'Guitars in General' started by T Dizz, Apr 13, 2016. Page 180. I had no idea they would be in there and started yelling OMG!!!! leftybill, Lyle Devine, ultradust and 65 others like this. Man, that's freaking cool.. Congrats man..
T Dizz and pressure like this. Neat-O! 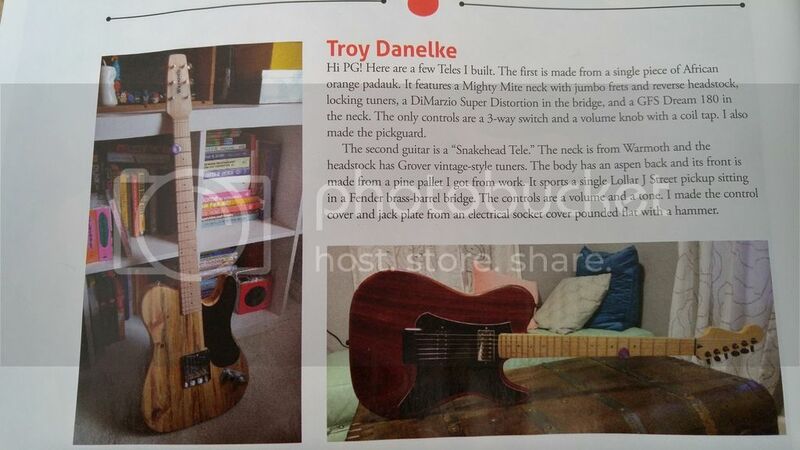 Nice to see a Warmoth product there! They actually mention the new Warmoth Nomad (explorer) in the Gear Radar section this month too! I dig the right handed reverse warmoth neck. And they're both teles! Good job, t dizz! phazersonstun, StevenO and T Dizz like this. Very cool! They look great, btw! Without question something to be proud of! Congrats!! That's awesome, man! Nice job! I like the Tele made from a pallet. Is the pallet wood soft? Is it bright or dark? Does it resonate nicely? It's pine, so it works great and is solid. I would say it's bright sounding when unplugged and resonates like crazy. I'm actually really impressed by the tone of that one. The Lollar in it is killer as well.